Unfortunately, the two election related bills we most wanted to see pass this session failed to reach the Governor’s desk. 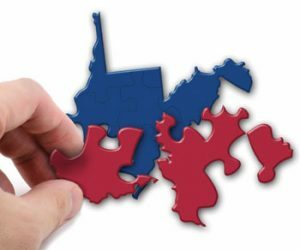 A bill to reform the redistricting process – the redrawing of the boundaries of legislative and congressional districts – made significant progress before stalling in the House of Delegates. While a bill to improve election transparency and strengthen disclosure of political spending was never taken up by its assigned committee. As part of the Our Children, Our Future campaign, we collaborated with Fayette Fair Share to support the WV Anti-Corruption/Voter Empowerment Act, and these bills would have accomplished two important goals of the Act. Below is a summary of what happened with these, other election, and ethics bills during the 2018 legislative session. HB 2383, would have established an independent commission to lead redistricting efforts after the 2020 census, rather than continuing to allow legislators to draw the maps that govern their own elections. The bill gained momentum, when the House Judiciary Committee took up another bill (HB 4002) mandating that the House go to 100 single member delegate districts when the maps are redrawn after the next census. Delegate Mike Pushkin (D-Kanawha) offered an amendment to HB 4002 to establish an independent redistricting commission. Although the amendment failed, Chair John Shott (R-Mercer) agreed to give the Committee the opportunity to review HB 2383. HB 2383 was assigned to a sub-committee, and after a few meetings, made good progress in coming to an agreement on the composition of the commission, qualifications for members, and how they would be chosen; developing a list of factors that could be considered (and not considered) in the process of drawing new maps; and providing opportunities for public input. But, when the subcommittee met for the final time with the goal of approving a draft bill to send to the full committee, they adopted an amendment to take out the commission and continue to leave the process of drawing legislative and congressional district maps up to the legislature. 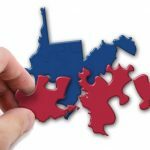 The bill that went to the House floor would have established a specific list of factors that can (and cannot) consider in the redistricting process, including factors designed to promote partisan fairness and prevent favoritism toward incumbents, which are worthy and important goals. However, the bill stalled after House leadership moved the bill to the House (inactive) Calendar, presumably to avoid a lengthy floor debate on an amendment proposed by Delegate Pushkin to include an independent commission, and failed to advance even after Delegate Pushkin agreed to withdraw the amendment. HB 4002, the bill mandating 100 single member delegate districts, eventually passed both houses and was sent to the Governor, but not before the concept of establishing an independent redistricting commission was debated again in the Senate Judiciary Committee. 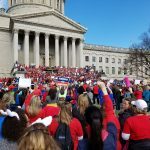 This second round of debate came in response to an amendment offered by Senator Stephen Baldwin (D-Greenbrier) to incorporate the provisions SB 54, a bill he co-sponsored with Senate Judiciary Chair Charles Trump (R-Morgan) and others, into HB 4002. Although it’s disappointing that an independent commission didn’t come to fruition this year, the time spent debating the idea helped elevate the issue, laying some groundwork that we can build upon in future sessions ahead of the 2020 census. A bill (SB 40) to close loopholes in existing law that make it possible for groups that spend money on political advertising to hide the identity of their donors, was never taken up by the Senate Judiciary Committee. The bill would have required any group that spends money to influence our elections to say where their money came, putting an end to big money laundered through groups with secret donors. As SB 40 languished, and with the deadline for bills to be out of committee in the house of origin fast approaching, the Senate Judiciary Committee took up and advanced another bill that would have exacerbated the problem of secret money in our elections. 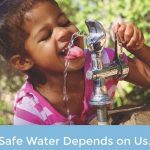 SB 595, dubbed the “Protect Our Right to Unite Act” would have prevented any state agency from requiring an entity organized under Section 501(c) of the Internal Revenue Code to provide it with donor information. Many of these entities, and 501(c)(4) groups in particular, serve as conduits for much of the dark money spent on elections. Because they aren’t technically political organizations, these groups aren’t required to disclose their donors to the public, even though many skirt or defy the limitations on political activity. As introduced, SB 545, would have afforded them additional secrecy under the guise of protecting freedom of association. Fortunately, the version of the bill approved by the Senate Judiciary included an exception for election related disclosures and financial disclosures required by the WV Ethics Act. Although these exceptions improved the bill, we weren’t disappointed when the bill wasn’t taken up in the House. HB 3004 relates generally to vacancies in elected offices and requires a vacancy to be filled by a person of same political party with which the person holding the office was affiliated at the time the vacancy occurred. The change was made in response to a situation that arose in 2016 after the resignation of then State Senator Daniel Hall. Hall was elected to the Senate as a Democrat in 2012, but switched parties after the 2014 election, giving control of the Senate to Republicans. Hall resigned in January 2016, raising the question as to which party would nominate his replacement. 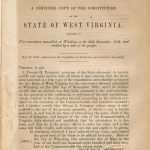 Because state law is somewhat ambiguous, the decision was ultimately made by the State Supreme Court, which required then Governor Earl Ray Tomblin to appoint a Republican to fill Hall’s vacant seat. HB 3004 makes the law consistent with the Supreme Court decision, but applies the requirement to statewide offices, as well as county commissioners, in addition to legislative offices. Last year, Governor Justice vetoed an identical bill (SB 255) saying “it rewards political tomfoolery rather than the will of the voters in the previous election.” This year, he allowed the bill to become law without his signature. HB 4434, clarifies which candidates can make use of the petition nominating process to be placed on the general election ballot, and prevents indivduals who are registered as members of a political party from using the process to seek candidacy for office. The bill codifies another State Supreme Court decision stemming from former State Senator Erik Wells’ 2016 attempt to use the process to run for county clerk in Kanawha County. In its ruling, the Supreme Court determined that the petition process is only available to potential candidates who are unaffiliated with a political party. A similar bill (HB 2798) passed the House last year but was not taken up by the Senate. At the request of the Secretary of State, the Legislature approved and sent to the Governor a bill that would allow counties to apply for and receive grants to purchase voting and other election related equipment such as electronic poll books. Grants would be made from federal funds initially provided to the state through the Help America Vote Act (HAVA), which specified certain requirements for new voting systems, and required states to replace outdated punch card and lever machines. The stand-alone bill (HB 4540) was ultimately rolled into the provisions of SB 548, which gives county commissions the discretion to pay election officials more than the maximum currently allowed by law. Finally, the Legislature also approved and sent to the Governor a bill that expands the WV Ethics Act to unpaid volunteers who do work for elected officials. HB 4424 was proposed by legislative leadership of both parties after the Charleston-Gazette Mail revealed that Bray Cary, a former broadcasting executive and current member of the board of EQT Corporation, was serving as an unpaid advisor to Governor Jim Justice.